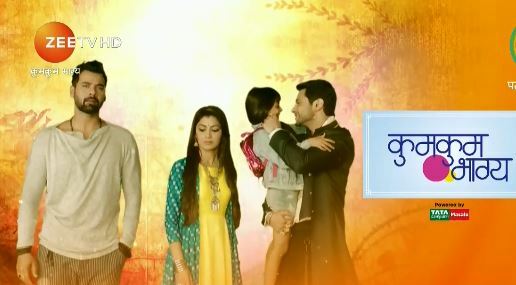 The Episode starts with Abhi telling Pragya that he got Kiara and his DNA test and it matched. He says it is clearly written that Kiara is my daughter, our daughter. He says why did you hide this from me, what was your helplessness. He asks how can you hide such a big truth from me and asks her to tell. Pragya cries and gets emotional. She hugs him and says I was scared. Abhi asks why? Pragya says I thought if I take Kiara to you, then you will take her and will punish me for the mistake which I haven’t done. Abhi says didn’t you see love in my eyes. He says Kiara was away from her father for many years and asks what do you think that I will separate her from her mother. Pragya says sorry. Abhi says you gave me such a big happiness, that I can leave my life, but not you. He says I don’t want kiara alone, but my family. He says both of you are similar and says when I see her, I miss you and when I see you, I miss her. He says did I say you that I came in this world to meet you and love you. He says today if I am alive is because of you, so I want to stay with you, live with you. I can’t separate Kiara from you. He says first we were two, now we are three. He says I am pleading and begging infront of you and asks can I get my Kiara and family. He says I can’t stay without you both and promises her that he will not fight with her and will not let her go. He says I can do anything if you are together. Pragya says we will stay together, you, me and Kiara. They have a hug…It turns out to be Abhi’s dream. He thinks I have started dreaming again and says I am going alone, but will return Kiara and Pragya. King is at home and thinks of Pragya’s words. He thinks why Pragya met me and asked help from me, she made my career and says he didn’t understand the Karmic connection. He thinks he listens to Pragya and realizes he is in love with her. He thinks Chachi had told me, and thinks if she is right about me then she is right about Abhi. He thinks if Abhi has feelings for Pragya. Abhi comes to King’s house. Bahadur is standing at the door and tells Tanu that nobody came. Tanu says I know. Disha hears them. Bahadur asks her to go to her room and says he will bring the report to her room. Tanu scolds him. Disha hears them. Door bell rings. Tanu sends Bahadur to kitchen and opens the door and gets the report. She checks the report and reads that sample was contaminated. She thinks Abhi couldn’t prove that Kiara is his daughter, then why he was happy. He shall be sad and thinks he might be happy to make her feel sad or jealous, and thinks it is good. She thinks once Abhi loves her then she shall not be scared from Pragya. Disha is hiding and smiling. She recalls waiting outside and colliding with the delivery guy and replacing the reports. She thinks Tanu will be confident now and will not do anything. Abhi rings the bell. King sees him peeping inside. Abhi asks where is Pragya? King says not today and says today we will talk about your behavior which changes seeing Pragya. Abhi says I want to meet Pragya and says he will go to school and meet her. King asks him to forget Pragya and take her out of his heart. Abhi asks what happened? King says Chachi told me that you have feelings for Pragya, but I ignored her words and told that Abhishek is my friend and can’t do this, but after whatever I have seen with my eyes, I have realized that you have feelings for Pragya. Abhi says you are thinking wrong. King says when I kept my hand on her shoulder, you felt pain and when I was about to dance with her, you held her hand and took her to dance floor. He says it was cheap thing and asks him to say yes or no. he says Chachi saw you and Pragya together, but I said no, my friend can’t do this. He says I didn’t know that my friend comes to meet my wife at my house, and have soft feelings for her. Abhi says I am friend and about to tell…but King asks him to say yes or no, and asks him to say if he has feelings for Pragya. Abhi says yes.